...Not gonna take any statement seriously that begins with an adaptation that honors the books after that Clip show nightmare. I'll take it seriously once we know the following : Animation Studio , VA (JPN & ENG) , Composer , format of adaptation , and Show/Film Length. You succeed in all these and you might have produced the 2nd best Tv/Film adaptation of Berserk. Pretty sure the anime Studio will stay the same. Wouldn't make sense otherwise, especially because of the licensing matters and such. Besides that i don't have high hopes for this at all, especially if this really will be done by Studio 4 °C. Cool, can't wait for the teaser. After waiting so long since the original anime, and only being able to remark tell me why about the movie trilogy, it's great to see Berserk resume in animated format. It can only get better! The two notable things are that we don't know the format yet, and that NBC Universal is now producing instead of WB. Man I'd really love to have a behind the scenes look at everything that went down with this adaptation. This is a scene from the Lost Children chapter, when Guts sleeps in the dilapidated windmill. Not surprising to be honest. Full visual without the text. So, Lost Children, eh? That's pretty cool, and I guess it doesn't make sense to adapt The Black Swordsman arc after having entirely skipped it and it's exposition. So, can we look forward to a new fabricated meeting between Guts and Puck? I think that would be weird given that his main adversary is fairy-like. They could still do the bar scene, I guess. It just wouldn't be in Koka. Well done, now I'm already depressed. Will this affect the manga monthly releases until summer? In that case I'm depressed too. I doubt that's the reason for the hiatus. While Miura was involved as script overseer for the 1997 anime, his involvement in the 2012 movies was negligible to nonexistent. Sad to say that I am excited for other anime's coming in 2016. Watching the previous 4°C movies gave me good idea on how they will continue butchering the story. My initial gut reaction was pretty excited to at least see Black Swordsman Guts running around in one of my favourite chapters. But without the Black Swordsman arc we have a lot of plot points that need to be squashed and fitted into what was already a tightly packed, neat story. Obviously things like Guts acquiring a behelit are easy to work in, but assuming we're not starting back at Godot's mine the incident with the demon fetus and Gut's acquiring his gear will need to be shown in another one of those stylised "flashback" sequences, which frankly would be a disservice to the moment. This also means Godot as a character will not have been introduced, meaning Guts's return to the cabin and chastisement for leaving Casca will be redone. Black Swordsman may not have been the best written arc but i love it for the comparison we get when we finish the Golden Age and go back into Lost Children. The way Guts treated puck when he first met him compared to after he had survived the count and the Godhand is just that little bit softer. And the fact that Jill emerges out the end of the story stronger than she was before stands out so much brighter compared to what we had seen happen to Collette and Theresia (also no crying guts ). I mean of course you can still just show Guts easing up to puck throughout this movie a little faster than usual, and the end is emotional regardless of whether or not there was any "predecessor", but it just makes those soft moments a little less soft. because its the first time seeing it all. I hope i'm not being way too negative, i'm always happy to see new Berserk, especially something that brings new blood into the fandom. Although the return to irregular schedule has dampened the parade even more. The only thing I have to say about this is at least they went back to the original design for the scar on his nose. Well, I am excited!!! The only bad news about this is the manga hiatus. I know the general consensus here is death to Studio 4C, but who knows, maybe this time they will stay truer to the source material for the Lost Children arc, especially if it's a longer format (crossing fingers for OVA). It's been many years since the trilogy, so the team, animation style, and director might very well be different. So as of right now, I'm excited to see what's to unfold in the next few weeks. This brings me back to the excitement the first time around when the Anime Saga was announced. It was around the holidays as well. GOOD TIMES! And finally, if all goes well, this means we might get a new Berserk Hirasawa song down the line. JUST SAYING! Really interesting, I assumed that the previous three Berserk movies didn't do well enough to warrant more anime, so I'm curious to see what format this will take. Also, isn't Guts wearing some incorrect gear in that picture? I could be wrong though. With Miura taking a break shortly, I am even more excited to see where the story leaves off this coming issue. Black Swordsman may not have been the best written arc but i love it for the comparison we get when we finish the Golden Age and go back into Lost Children. I think it's pretty damn well written, actually. Also, isn't Guts wearing some incorrect gear in that picture? Indeed he is, as Mangetsu and Walter mentioned. Just continuing the trend from the movies. I'm curious to see what direction they'll take for that one. 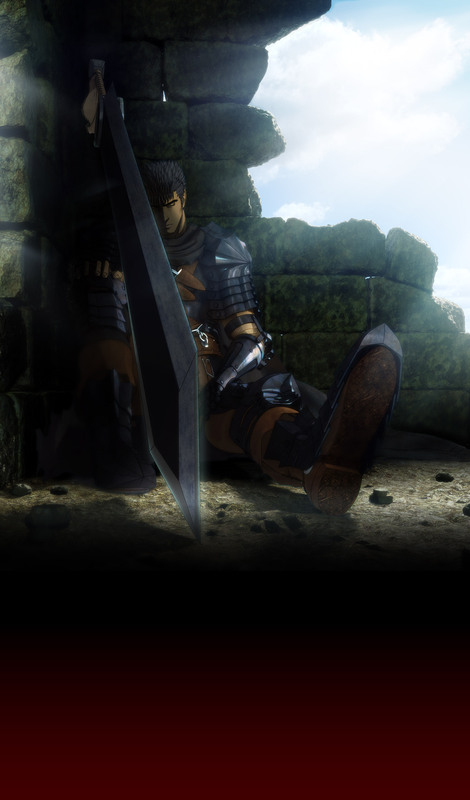 I hope indeed that we see Guts getting is black swordsman gear and I would like it to see the count. I guess we can start by waiting for the teaser trailer or whatever they're gonna show at that convention. Just continuing the trend from the movies. If that is the scene from volume 14 in the old wind mill, there are so many little things wrong with it. It's the movies all over again. I guess there is always hope, but I'm not holding my breath. We didn't need the Bonfire of Dreams or the Queen's assassination. Do we really need Godot? As others have said, I wouldn't read too much into this image as to the direction of the adaptation; they might have just decided on this as his iconic "Black Swordsman" uniform for the duration, though it's worth noting at the end of the third movie he's wearing something more resembling his initial Black Swordsman gear. Anyway, here's hoping they don't skip the original BS arc. If they're sticking to the film format and want to do something reasonable and fitting the mold of the previous trilogy they should do another one of Black Swordsman, Lost Children, and Conviction, ending with the incarnation ceremony this time. Of course, who knows, but otherwise I sure wouldn't mind them doing things as drastically different as possible from their previous effort. It could be a TV show or OVA attempting to span far more territory or a just one film focused on one part (I agree with DK on an OVA, I think it has the best potential to do something worthwhile). We'll see, but I must say, as I complained recently, at least they're animating parts of the story that weren't done previously, so I'm excited on that count at least, and even though I certainly didn't like the new anime movies, at least this venture hasn't ended on that sour note as a complete crash and burn and something more, and hopefully better, will come of it. Wonder what what the format for the new anime will be? TV series, OVAs, or movies again? Like others have mentioned I think OVA might have the potential to be the best fit. And like Walter said while the the current promo image seems to imply beginning with the Lost Children chapter, hopefully there is still a possibility of the Black Swordsman arc being adapted as well. Anyways, even if the story adaption quality is on a similar level of abridgement as the movies were, there should hopefully be some nice animation to look forward to at least. Also, in regards to the new Blu-ray release of the 1997, is the only difference (that we know of currently) from the 2012 Bu-ray release going to be the manufacturer's suggested retail price? Also as DirectDK said hopefully this means a new Susumu Hirasawa Berserk song down the line as well. Well, I was excited for a second. Then I remembered everything that was missing in the movies. Is it even possible to salvage the berserk movies with OVA's? I wonder if we,re gonna have the same one as the last trilogy. There was after all scenes post-eclipse in the little clip in the movie titles. I'd find it cool if we get a new one by Hirasawa.